In this special guest post, family historian and workhouse expert Peter Higginbotham explores the fascinating stories revealed in Findmypast's workhouse records. Go far enough back and most people researching their family tree will come across some kind of workhouse connection. 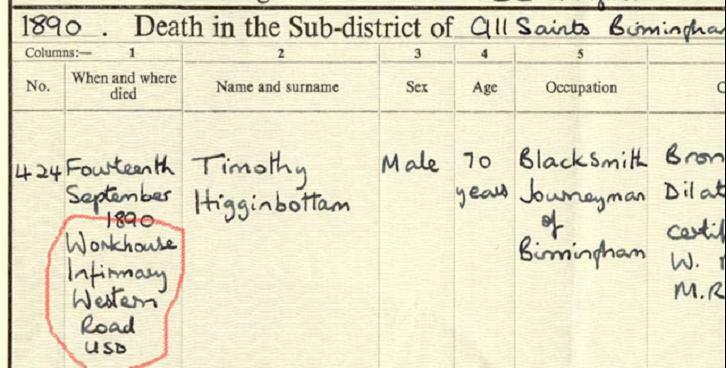 For me, it was when I received the death certificate of my great-great-grandfather Timothy Higginbottam and discovered he'd died in the workhouse infirmary at Birmingham. I'm sure Timothy would have been amazed to know his sad demise would spark such an interest in one of his descendants more than a century later. One of the first things anyone researching workhouse ancestors discovers is that the survival of their records is very hit and miss. Voluminous records were kept by each establishment at the time, but over the years many were pulped, destroyed by wartime bombs or simply thrown away. It's therefore vitally important to make the most of what still exists. Findmypast has a growing collection of workhouse records from a number of poor law unions (the administrative areas of the poor law system after 1834) in areas including Manchester, Cheshire, Derbyshire, Lincolnshire and Monmouthshire. These include admissions and discharges, baptisms and burials, and religious creed registers. In some cases, page images of the original registers are even provided, while others are transcriptions. Creed registers, introduced in 1869 to assist local clergymen in identifying new arrivals of their own particular persuasion, are particularly useful. Although, their format varies a little between unions. As well as religion, they include dates both of admission and discharge, and are grouped by first letter of surname which makes browsing much easier. They sometimes include other helpful information such as names and addresses, relatives or friends, as shown in the extract below from the Chester workhouse creed register in 1885. The creed register for Northwich Union workhouse is distinctive in that it provides columns for multiple successive admissions and discharges. For some inmates, the workhouse was a revolving door as can be seen in the extract below from the Northwich Union workhouse in the period 1908-10 for a man named James Sandbach who was born in 1840. His multiple stays in the workhouse ranged from a few days to several weeks. I wonder what that poor fellow's story was? Workhouses also feature, of course, in civil records such as the census. The census is a particularly interesting as it provided a snapshot of the whole institution and its inmates. Even if you don't know the name of someone who was in the workhouse for a particular union, there's a nice feature you can use to locate its census records. 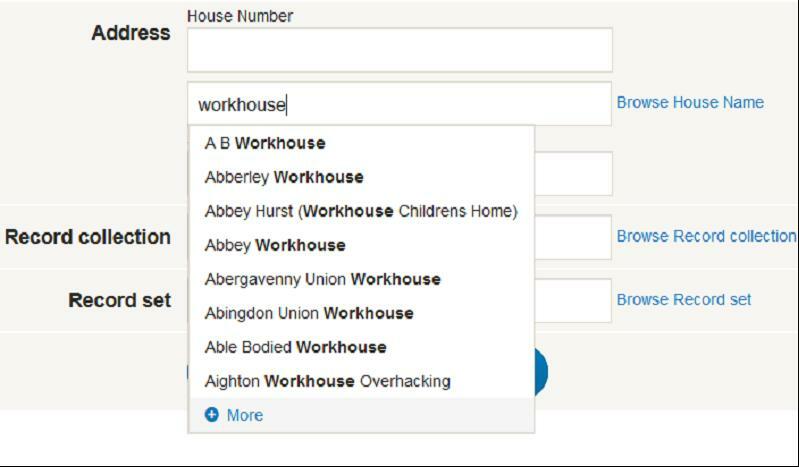 On this screen, in the 'Browse House Name' box, type the word 'workhouse'. Then scroll through the list to find the place you want. If you can't find the one you want, other variations to try entering are 'work house' (i.e. with a space in the middle) or 'union'. The name recorded for a given workhouse may vary from census to census.